Using a custom built cable connected to the lower GBA slot and a copy of Canon’s SDK, [Steve Chapman] has come up with a very clever way of taking pictures remotely with a Nintendo DS Lite. Currently the software supports bracket shooting as well as bulb mode. [Steve] points out that he is currently testing an audio based trigger system using the mic built into the DS and the software is still a work in progress. While the weight saving benefits of using a DS instead of a notebook are obvious, there are things you do give up going this route. Traditionally, when you tether a camera to a computer the photos are saved directly to the computer where you can view the image on a much larger monitor. With the DS, it seems all you can do is remotely trigger the camera. Given the size and resolution of the screens maybe that’s all it can do. [jon barber] pointed out another great project on the benheck forums that hasn’t gotten much attention. [techknott] built a wireless video interface for his Xbox 360. Think of it as a sort of video game thin client. It has the form-factor of a portable but doesn’t include the 360’s components. Instead it has a 1.2GHz A/V receiver and the guts of a wireless controller. The specific transmitter was chosen because it wouldn’t interfere with the 2.4GHz controller. The power supply is two 2600mAh batteries running at 7.5V with a built in charging circuit. The draw from the screen is ~500mA. The entire unit is 1 inch thick. mySQLgame is a quirky App Engine game that has decided to forgo flashy UIs and just stick with the core of the system: a database. You start the game by creating your own row in the shared game database. Game time increments your fuel and money resources every ten seconds. 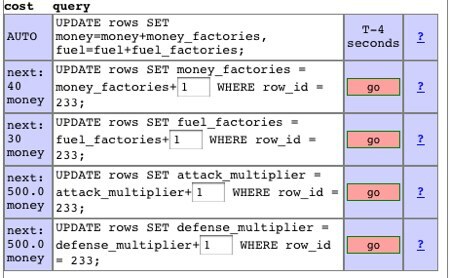 Fuel is spent on scanning other rows and for attacking. Money is used for upgrades and building units. Build up resources and attack your neighbors using database queries, just like any other game. Like a bit more gloss on your internet metagames? Have a look at trolling simulator Forumwarz. Pitchfork.tv is showing the documentary Blip Festival: Reformat the Planet for one week only. The Blip Festival is an annual chiptune event in New York City featuring musicians who use video game consoles as part of their production. The documentary has a ton of artist interviews and music from all across the spectrum. Most of the initial featured artists are using the Game Boy LSDJ tracker cartridge. [Nullsleep] has put together a tutorial for the device. You’ll see a lot of other old hardware and hear discussions of coveted mods like adding backlights as well. [Mark Denardo] is shown using a PSP as part of his performance. Other people are using software like Fruity Loops to build tracks with Nintendo samples. Honestly, our favorite part was a clip of the loud objects doing a live soldering circuit bending performance on top of an overhead projector at the Bent Festival. Although not musical, Element Labs’ Versa TILE makes a fairly mesmerizing backdrop throughout the film too. You can find links to all the featured artists on last year’s festival page. Blip Festival 2008 happens December 4-6 in Brooklyn, NY. The first video game every created is attributed to physicist William Higinbotham. Tennis for Two is played on an oscilloscope using two controllers. Each one has a knob that controls the trajectory and a button to hit the ball. 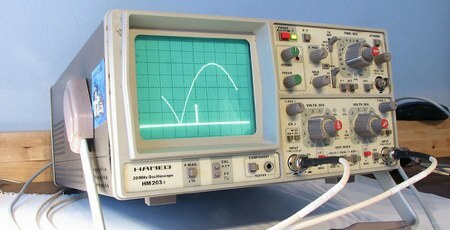 The fine folks at Evil Mad Scientist Laboratories have recreated the game so you can play it on any oscilloscope. An ATmega168 is used to control everything. It takes user input from the paddles and outputs an the X and Y analog signals for the scope. An R-2R style DAC is used for the output stage which gives a 256×256 resolution. Everything is built on top of one of their business card sized project boards-which really shows how useful such a simple board can be. The source code is free and the write up includes plenty of detail. We’d love to see what modifications people come up with since the base game doesn’t even have scoring. There’s a video of EMSL’s system embedded below. A team of five high school seniors have released some videos of their new Guitar Hero bot named DeepNote. This bot uses a group of custom photodiode modules with an 8 nanosecond latency placed on the screen to sense the notes. The Parallax Propeller system takes this input and controls solid state relays hooked into the guitar’s circuitry. After we looked at a few videos of the early prototype system, we could really see how it has evolved. They have custom PCBs and a really nice frame for the photodiode sensors. You can find more info on their How It Works page and view a demo video embedded below. The Universal PCB project lets you make any controller (specifically arcade sticks) console agnostic. A PIC microcontroller is used to translate between the button presses and the signals for the specific console you’re connected to. It uses a DB15 for the external plug. The PIC knows which console you’re plugged into based on which pins are high or low in your console specific adapter cable. 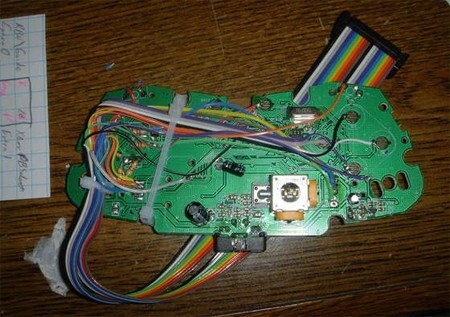 The board includes a piggyback plug so you can plug in an Xbox360 controller board (like the one above) since the console requires authentication. The PIC’s firmware is conveniently upgradeable over the USB cable.